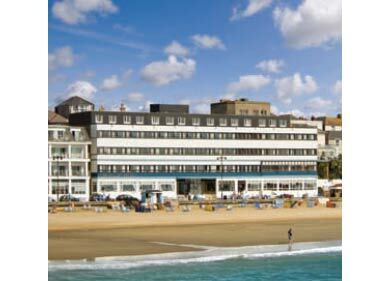 Situated centrally on Sandown’s seafront, the Trouville Hotel is the ideal location for an Isle of Wight Break. Opposite the golden beach and with panoramic views over the sweep of Sandown and Shanklin Bay, the hotel offers the comfort and care for a well deserved break. The hotel’s 88 well appointed rooms, most with sea view, provide the facilities expected by today’s well travelled guest.Relax and unwind, days can be spent lazing in the bars and lounge, watching the ocean liners pass and the world go by. The hotel comes alive in the evening, with live entertainment in the stylish and Island’s largest hotel ballroom. Out of season, the Trouville Hotel is a firm favourite for dancing holidays, renowned for line dancing, sequence, rock n roll and more. The hotel also boasts the ‘Green Room’, again with uninterrupted sea views, with 4 dedicated lanes of Short Mat Bowls, trim-gym and indoor leisure pursuits. Whether it is your summer bowls tour or short mat bowls break, the Trouville Hotel is dedicated to the needs of the bowling tourist. The Trouville is the perfect venue for an Island break. We have a proud reputation for delivering high standards in food, service and hospitality. There are some great hotel deals on our special offers page, so there has never been a better excuse to pop across the Solent and explore our wonderful Island.